Eric Bibb plays a mix of Blues Folk gospel acoustic guitar. If you haven’t heard him play I highly recommend you have a listen. His guitar playing is very smooth, in fact he’s one of those players who plays just what’s needed, he doesn’t over play. Eric has a very good voice that works beautifully with his guitar playing. This song ‘In my Fathers House’ has a very strong rhythmical fingerstyle picking part. A few months back I woke up one Sunday morning and had a techie problem witha web site, I spent a few hours trying to sort it. After this period of time I decided to call it quits for the day, by this time I was very frustrated. 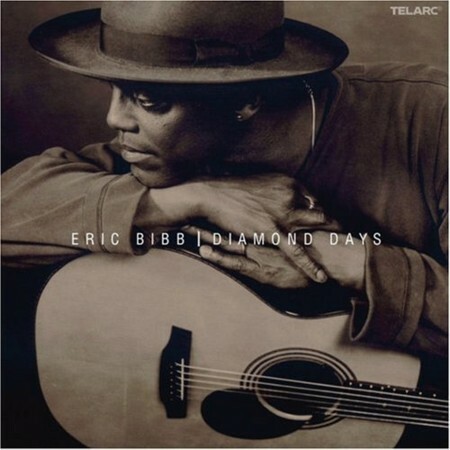 I wandered downtstairs, put on Eric Bibbs Diamond Days album. Within a few minutes of listening, I found myself in great spirits. Have you ever been to see someone play music and it seemed like they’ve played what sounded like almost the same song all night? Sound familiar? So how to get around this? If you are new to performing you may not even realize that you are doing something a bit like that. As many players want to get out of the practice room and into the public arena, it’s worthwhile thinking about the songs that you play, not just whether you like them but whether there;’s a good balance in what you do. Now ladies and gentleman, here’s blues ballad number Seventy Three for the evening. No matter how good you are, or think you are, boring is boring. So here’s a few ideas to get you thinking clearly. Look at what Keys your songs are. Are most of them in the same key? Do all your songs have the same type of chords, mainly majors, or mainly 7th’s if you are doing blues? Have you fashioned yourself on another band or player and do too much of their material? Do you only do originals? I love original music but if you add the odd familiar song it can add a little familiarity for new listeners to you gig. Is your song list predictable? Why not throw an odd song in here and there? Are all your songs the same mood? People like top go through different emotions. Make the audience laugh and cry? Do you communicate with the audience? You could always play the whole gig with them shut. Do you try and show off in every song just how brilliant you are? Don’t play everything you know in one song. Space it out a bit and add the element of surprise. Do you only play fingerstyle picking? Play some rhythmic stuff and some plectrum guitar if possible. If you have given it your best shot, tried your best and followed the above, if people aren’t happy at the end of this…they may never be happy and this is not your problem. OK, when I sat down at my computer I had planned to post about something else but we ended up with this and it’s vvery useful…you don’t necessarily have to follow the above but at least it will get you thinking. If you have about 2 minutes to spare, please do the Survey so I can develop my sites even further. This is a good tutorial. Scott is a very good player, if you want to hear him in full flight, check out the song Senor on the Tim O’brien album. In full flight he’s as good as anybody and has a very clear tone. In this tute he’s using a small bodied guitar. What I highly recommend is that you learn the fretboard properly, this is a prerequisite for learning and playing properly. I originally was looking for a Scott Nygaard youtube to write about because I like his playing and felt that it would be to guitar players benefit to hear him and I found this tutorial. For more information about Scott Nygaard go to Scott Nygaard you will find information about his projects and albums there. For years now I’ve been a lover of both Indian music and the blues. Due to my studies with the Sarod player Ashok Roy I have played quite a few instrumentals in open tuning, I used to use the tuning B, F# , B , F#, B and E working from the Bass up, the bottom end of the guitar was tuned quite low. I found it very interesting playing in this tuning. My teacher used to sing the parts to me, I’d sing them back, then I’d transcribe it in the Indian notation and then play it back. I first heard of Harry Manx a few years ago when he toured my local area. What I like about he is he has bridged the gap between Western and Indian music quite well. he plays the Mohan Vina, an instrument played by the musician Pandit Vishwa Mohan Bhatt. The vina is a traditional Indian instrument in a similar vain to the sitar. I feel it is important to see what some of the musicians are doing that are playing a little outside the norm because when we hear new things they can create new possiblilities for other players. I’ve linked to two youtube videos of Harry Manx the Canadian player, one is blues slide and the other a mix of Indian and blues. How comfortable does he look playing? The aim of this blog site is to inspire guitar players. Early today I was writing a Blues Variation Scale for my other guitar blog and I thought it would be a good idea to write a very simple Blues In G for Acoustic Guitar because the other blues I wrote was more of a scale variation than a song. My humour got the better of me when I went to name it and I could help calling it ‘G String Blues’ . This blues doesn’t use any full chords but uses parts of chords. I find this way of playing chords can open up a guitarists playing. It’s built around a standard Minir Blues scale that consists of the notes G, B flat, C , D flat, D, F, G, it deviates out of that on a couple of occassions over the C7 chord and also over the D7 chord. This way the chords are ‘IMPLIED’ , not actually played but hinted at, this helps create a little tension and release. For those that aren’t readers of music dots, don’t be too concerned, just note that the first chord of the G7 bar is held for one whole beat and from then they are half beats. e.g. count 1 2 and 3 and 4 and. As I have stated, this is a simple blues but it can be built upon and would make a very nice jazz blues, try to vary the melody a little once you get it in time. The band included the very almost famous Steve Marriot, he went on to form Humble Pie the great rock band. If you find where I can get one of those outfits please let me know. The song yesterday by Paul McCartney is an all time acoustic classic. It is very melancholy and is one of those songs that if you were around at the time when it was popular would somehow stop you in your tracks and make you think a little seriously. The youTube video of Yesterday starts of mainly showing Paul mcCartney singer but as the song goes on, the guitar part is shown. It is a classic song that millions of guitar players have played over the last 40 years.